Hello all! Happy Sunny Fall Day. This story is about a lady who wanted a little more "bling" on her engagement ring. She had a solitaire marquise cut engagement ring and a gold wedding ring. She wondered about a halo and after investigating different size halo diamonds she settled on this beauty. 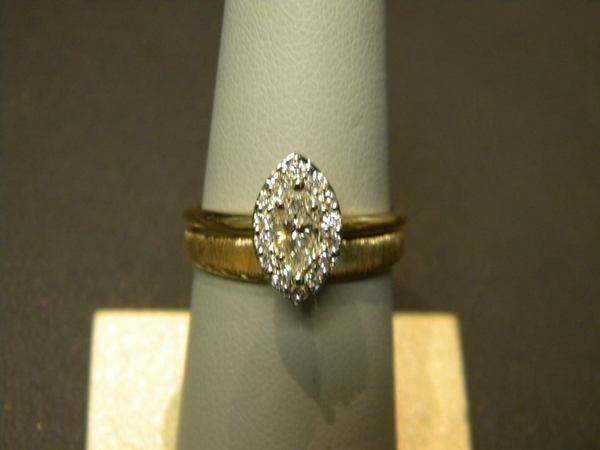 Her original setting was adapted, center stone reset and suddenly....a whole new "bling". Keeping the memories and reinventing the look. That's what makes jewelry so special. Have a great weekend!